Barbara at Winos and Foodies received a box of goodies from me which I think she liked ; I tried to include some of my favourite things. I was interested to see how my mincemeat turned out, since Barbara made mince pies before I did! Barbara put together a lovely parcel for Nigel at Curious Kai ; a thoughtful selection of food goodies including her homemade kiwifruit chutney. Céline at Angel at My Table was very happy to receive a brilliant box from Nigel including some locally (for Nigel in the Hawkes Bay) grown strawberries and cherries - such a good idea to send those! Céline passed the joy to Jules at the Wine Wanker with quite a selection including homemade grapefruit marmalade chocolate brownie. Bron was the happy recipient of Jules's gift, a great assortment of treats, not least his homemade Vanilla bean infused Lemonade syrup ; the deliciousness of which I can confirm! Arfi of Homemades found in her mailbox a parcel from Bron - just in time for morning tea! Bron had included homemade macaroons and her girls had helped with the parcel, making some finger puppets for Arfi's children - I think that is just lovely! Tim from Take 3 Eggs was treated by Arfi to some Asian pantry supplies, not always easy to find in the smaller places around New Zealand, as well as a homemade Christmas cake, cookies and chutney! Tim repaid the favour by sending Morven at Food, Art and Random Thoughts a parcel fairly bulging with home made goodies - including some blondies, which I have never tried, so hopefully Tim will reveal his recipe. Paul at Eat NZ opened a parcel from Morven revealing, to his delight, a fantastic selection of goodies including some homemade feijoa relish and new breakfast trend - french marshmallow! I was so very excited when on a Saturday morning Paul's box arrived. What a lot of wonderful goodies, including some homegrown beetroot and rosemary - a lovely idea to include something he had grown. I can happily admit not much lasted the weekend - but Christmas is not about restraint! 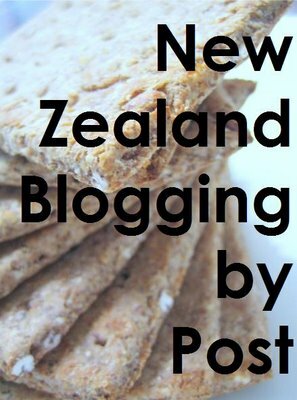 The inaugural New Zealand Blogging by Post was a fantastic success. We all managed to find local products, special items, and not least something homemade or homegrown - and to my mind - that is what it is all about! I think the next round should be all about Easter - I hope you will join in! Emma, it's good that you post this round-up NZBBP. Great to share. Would love to sign up again for the next one! Well done Emma, and well done food bloggers of New Zealand. Happy New Year.